The Battle for Modernism: Quadrante and the Politicization of Architectural Discourse in Fascist Italy (Vicenza and Venice: CISA Andrea Palladio and Marsilio Editori, 2012). Modern Ethiopia: Architecture, Urbanism and the Building of a Nation (research in progress). A Critical History of Contemporary Architecture, 1960-2010 (London: Ashgate, 2014). edited volume, with Elie G. Haddad. “Reviewing Modernism through the Lens of Sustainability,” in Lessons from Modernism: Environmental Design Strategies in Architecture, 1925 - 1970, Kevin Bone, ed., (New York: Monacelli, 2014). “"Urbanistica corporativa": Ernesto Nathan Rogers, BBPR and Quadrante,” in Ernesto Nathan Rogers 1909-1969, Chiara Baglione, ed. (Milan: Franco Angeli, 2013). “CIAM, Corporative Urbanism and Italy,” in The Rationalist Reader: Architecture and Rationalism in Western Europe 1920-1940 / 1960-1990, Andrew Peckham and Torsten Schmiedeknecht, eds. (London: Routledge, 2013). “Gondar. Architecture and Urbanism for Italy’s Fascist Empire,” Journal of the Society of Architectural Historians v.70, n.4 (December 2011), 467–487. “‘Everything in the state, nothing against the state, nothing outside the state’: Corporativist Urbanism and Rationalist Architecture in Fascist Italy,” Planning Perspectives v.27, n.1 (January 2012), 51-80. “Misprision of Precedent: Design as Creative Misreading,” Journal of Architectural Education v.64, n.2 (March 2011), 66-75. 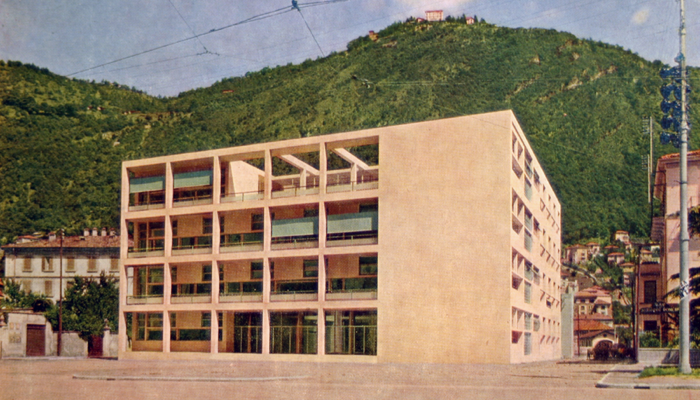 “Furnishing the fascist interior: Giuseppe Terragni, Mario Radice and the Casa del Fascio,” arq – architectural research quarterly v.10, n.2 (June 2006), 157-170. "Urbanistica corporativa": Ernesto Nathan Rogers, BBPR and "Quadrante" in Ernesto Nathan Rogers, 1909-1969, ed. Chiara Baglione (Franco Angeli, 2013). “Architecture and Revolution on the Street of Empire,” Scapes n.6 (Fall 2007), 26-40. “Asmara,” Pin-up n.5 (Fall/Winter 2008/2009), 14-16. “Dialectical Furniture for Highway Interchanges,” Catalogue of the History and Theory Graduate Studio [McGill University] v.5 (1996), unpaginated. “Speed Limits [review],” Design Issues 27:3 (Summer 2011), 98-102. “America Town [review],” Journal of Architectural Education v.63, n.1 (August 2009), 150-151. “Interama: Miami and the Pan-American Dream,” Cite n.78 (Spring 2009), 36-37. “Moderns Abroad [review],” The Journal of Modern History v.82, n.1 (March 2010), 216-218.
with Monica Cioli, “Lo Stato dell’arte. Fascismo e legittimazione culturale.” (The State of the Art. Fascism and Cultural Legitimization.) Scienzia & Politica v.XXV, n.48 (2013), 135-148. “Miami Modern and the Re-design of Lincoln Road,” Miami Beach Community Newspapers (9 June 2014). “A Story Told in Fragments,” Miami Beach Community Newspapers (28 March 2014). “An Edifying Composition,” Miami Beach Community Newspapers (28 November 2013), 21. “The Wolfsonian-FIU,” Miami Beach Community Newspapers (22 August 2013), 21. “Miami Beach Cinematheque,” Miami Beach Community Newspapers (22 May 2013), 21. “Excellent on So Many Levels,” Miami Beach Community Newspapers (15 March 2013), 21. “Flash Urbanism at New World Symphony,” Miami Beach Community Newspapers (15 March 2013), 21. Presentation at the education roundtable during the 5th African Perspectives Conference, Casablanca, November 2011. “Principles of Italian Colonial Urbanism,” poster prepared for the 5th African Perspectives Conference, Casbalanca, November 2011. “Pietro Maria Bardi, Quadrante, and the Architecture of Fascist Italy.” paper given at the international seminar: The Italians in the Centers of South-American Modernism, 9-11 April 2013, Museu de Arte Contemporanea, Universidade de Sao Paulo, Brazil. Ben Ikenson, “A Zero Sum Game,” Residential Architect (September-October 2013). “The Tin House,” Florida/Caribbean Architect (Spring 2013), 20-21. Kara Franker, “The Tin Box: Sustainable Construction in Miami,” HGTV Frontdoor (May 6, 2013).